There are two ways to eat vegetables. The first way is out of a sense of duty. These I’ll-eat-it-because-it’s-good-for-me dishes include iceberg lettuce salad and veggie platters. There’s nothing wrong with these dishes, per say. They’re just not going to stand a chance if there’s anything else on the table. Then there are vegetable dishes so delicious and filling that they serve as a main course. Our dinners are usually so full of veggies that I have to stop and think of a bread or grain dish to go along with them. Here are three ways we fill up on veggies…and stay full until breakfast. Toss the greens and veggies. Add the wheatberries and beans and then nuts and tofu on top. 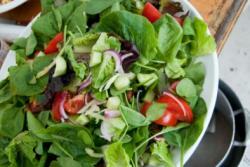 Dress with almond butter dressing or balsamic vinaigrette. Serve with homemade bread, like naan or soup. Or both. Saute the garlic and bread crumbs in a little bit of olive oil or butter until brown and bread crumbs are crunchy (this is a great use for leftover challah). Set aside. Saute the greens and onion in olive oil or butter until they just begin to wilt. Toss greens with tofu and feta and sprinkle generously with bread crumbs. Saute the onion in olive oil until soft and brown. Add garlic, ginger, green onions and the other assorted vegetables. Stir fry until brown and soft. When close to done, add the soy sauce, lemon, peanut butter and sesame oil. Saute for two more minutes. Mix in rice and stir fry for 2 more minutes. 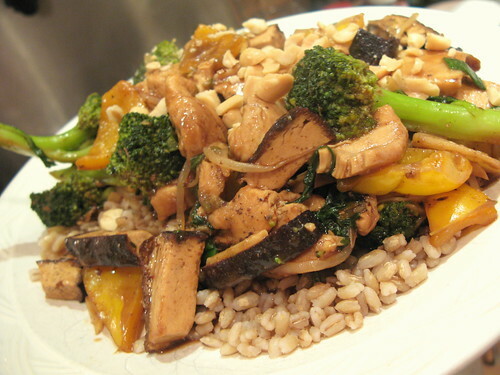 Add peanuts to the top and serve over brown rice. Brown the meat? I don’t see meat in the recipe. It does look good, though! This sounds yummy and healthy. I never thought of marinating tofu in tahini paste. It is great and so easy!